What is sales enablement? Sales enablement is a relatively new concept in the B2B sales industry. 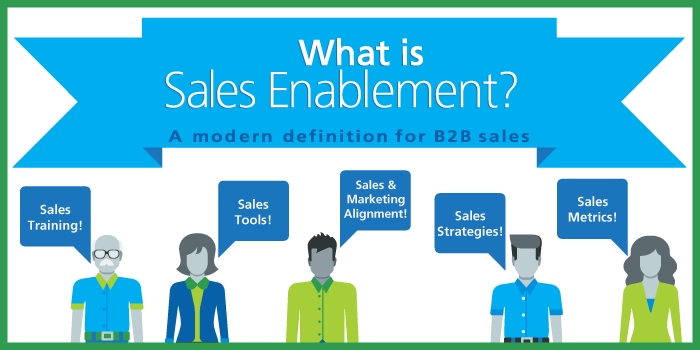 Because it’s so new, the definition of sales enablement is still evolving. Every day sees the advent of new technologies or strategies that revolutionize sales, and as a result, what may have been true about sales enablement a year ago is not necessarily applicable anymore. It’s important to have a solid grasp of what sales enablement is. Once you understand how it fits into your sales system, you can apply it to its greatest potential. 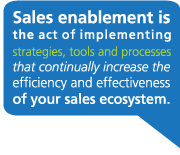 Sales enablement is the act of implementing strategies, tools and processes that continually increase the efficiency and effectiveness of your sales ecosystem. Yes, that’s a very (intentionally) broad definition, so let’s break it down even further. Too often sales managers, and specifically sales enablement leaders, are guilty of devoting their time and energy to planning strategies that never see the light of day. They talk about improvements, but those improvements never happen. That doesn’t fly. To achieve true sales enablement, you need action. You need to follow those great ideas with implementation. Does sales training count as enablement? What about a sales methodology? Or an email plugin? Yes to all. Essentially anything that improves sales falls under the sales enablement umbrella. However, don’t make the mistake of assuming that just because you implemented a sales methodology you’re golden. If every other aspect of your sales system is broken, you’ve still got a lot of work to do. Don’t rely on blanket solutions for your company. Instead, find out exactly where your pain points are, then find the sales enablement solution that best solves those problems. If sales enablement includes everything that improves sales, how do I know if I’m doing enough? It’s a great question, but a flawed one. 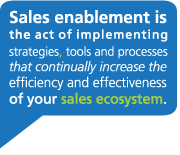 Sales enablement is not a “one and done” activity. It’s a process by which you continually seek to improve sales activities and strategies. From revising sales content to reevaluating onboarding practices, never stop looking for areas that you can continue to improve. Sales efficiency is performing sales operations activities in the fastest and most streamlined way possible in order to get the highest return on sales investment. Sales effectiveness is performing sales operations activities that will have the biggest impact on buyers and win rates. When you put those two together, you’re streamlining operations to focus on the highest impact activities. When you throw enablement into the mix, you’re finding new ways to make sales operations even more efficient and effective. Your sales ecosystem includes more than just your sales department. It includes anyone or anything that affects sales, from content created by the marketing department to overall company strategies developed by the C-suite. This means that when you implement a sales enablement solution, you need to look at the big picture of overall business success. Is a roadblock in the accounting department delaying sales deals from closing? Are sales reps waiting too long to send personalized presentations to buyers because those presentations have to be approved by marketing? Identify weaknesses—not just within the sales department but also the company as a whole. Businesses often try to improve sales activities and then realize they have no idea what’s working and what isn’t. The problem boils down to a lack of visibility—there’s no awareness and insight into how everyday sales processes result in lost or won deals. So in order to approach improvements strategically, the first step is to get visibility into the sales system by tracking the activities of sales reps and buyers. How are your reps spending their time? How are customers and prospects responding to different types of content or messaging platforms? What selling activities are most likely to lead to closing deals? All of these questions and more are able to be answered by gaining visibility through activity tracking. Sales methodologies are an excellent way to take an inefficient sales activities and turn them into a structured sales process, with easy steps for sales reps to follow in order to achieve their sales quotas. With strong implementation and follow-through, sales methodologies can give you a big impact relatively quickly. Here’s the important thing to remember: a sales methodology needs to be more than just ink on paper. It should be an integral part of everyday sales processes, something that defines the way your sales reps sell. If your sales teams aren’t using the methodology (or are using it incorrectly), your company poured money down the drain by implementing it. Keep that from happening by choosing a sales methodology that works well for your selling environment. A generic, off-the-shelf sales training course might be good for first-time training, but it’s not going to be as effective as a sales training course tailored to the exact inefficiencies your sales reps struggle with. According to research by Sales Alliance, 80-90% of sales training information is completely forgotten within one month. If you want sales training to stick, you have to reinforce it on a regular basis. You can learn about strategies to reinforce sales training here. Perhaps more than another other department, marketing interacts with sales very frequently. From passing on marketing qualified leads to creating sales resources for reps to send to buyers, marketers devote a lot of time and resources to sales’ needs. Unfortunately, the sales and marketing teams at most companies are misaligned—meaning each department is working toward its own goals without clear visibility into how those goals impact the other department. There is little communication, support and collaboration between sales and marketing, which leads to wasted resources, significant delays and overall inefficiency within the company. When you align sales and marketing, you move from two separate departments, to one revenue department that is completely focused on growing sales. To learn how to align your sales and marketing teams, click here. Manual sales processes are the bane of any company trying to increase the efficiency of sales. When sales teams spend all their time doing things like creating presentations or entering data into CRM, they’re not spending time selling. Implementing sales productivity tools such as CRM data automation, content personalization wizards, email templates, buyer research collection and more will give your sales process an instant boost in sales efficiency. You need to be careful not to treat sales enablement software as a Band-Aid to cover up poor sales management strategies. Get your sales process down, then use sales productivity tools to enhance that process even further. The definition of sales enablement is constantly evolving, which means your sales system should too. Research by Aberdeen has shown that 84% of sales reps at companies with best-in-class sales enablement strategies achieve their quotas, compared with 55% at companies with average strategies and 15% for laggard companies. In order to be best-in-class, you have to embrace sales enablement from every aspect. It’s a tall order, and it can’t be achieved immediately. Build a foundation for enabling sales teams that you can grow over time. Ready to start? Contact one of our sales enablement consultants today to learn what foundational strategies are best for your company. A great primer for those wanting to learn more about sales enablement, but the definition seems to always be changing as the industry evolves. We’ve found that looking into Sales Engagement (another new buzzword) offers a more complete platform package as enablement tends to just address a collection of tools.